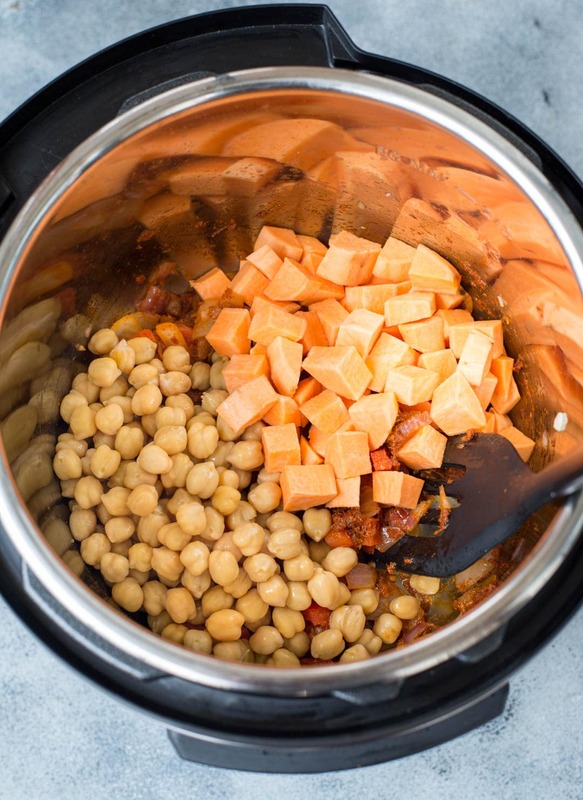 You need only 30 minutes to make this delicious Instant pot Sweet Potato Chickpea Curry. 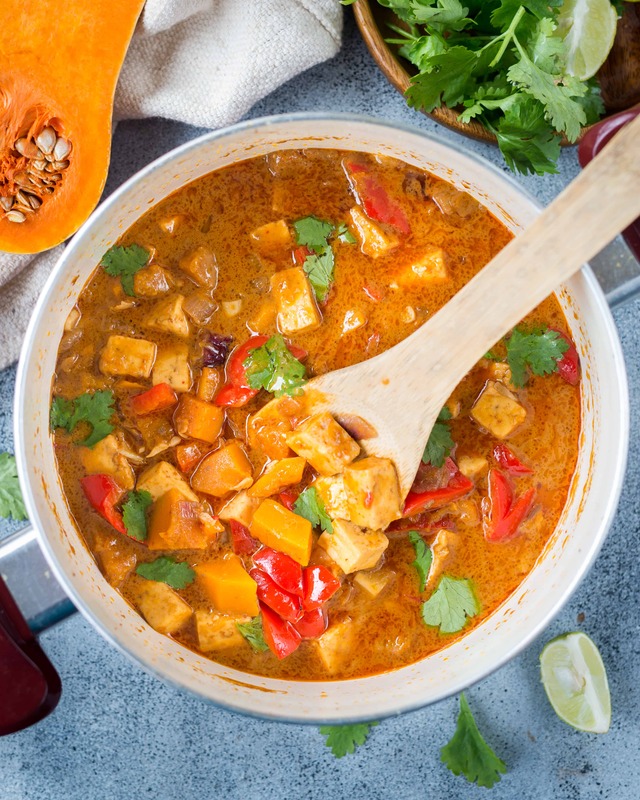 This fragrant and delicious Sweet Potato Curry made in the Instant Pot is Gluten-free and Vegan. 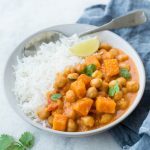 Instant Pot Sweet Potato Chickpea curry is incredibly delicious and easy to make. The silky smooth gravy has that fantastic Thai flavours from the Red Curry paste. It is the kind of curry, that I would label as the ultimate comfort food and can have all around the year. Using an Instant Pot instead of the stove top method doesn’t make this curry any less delicious. 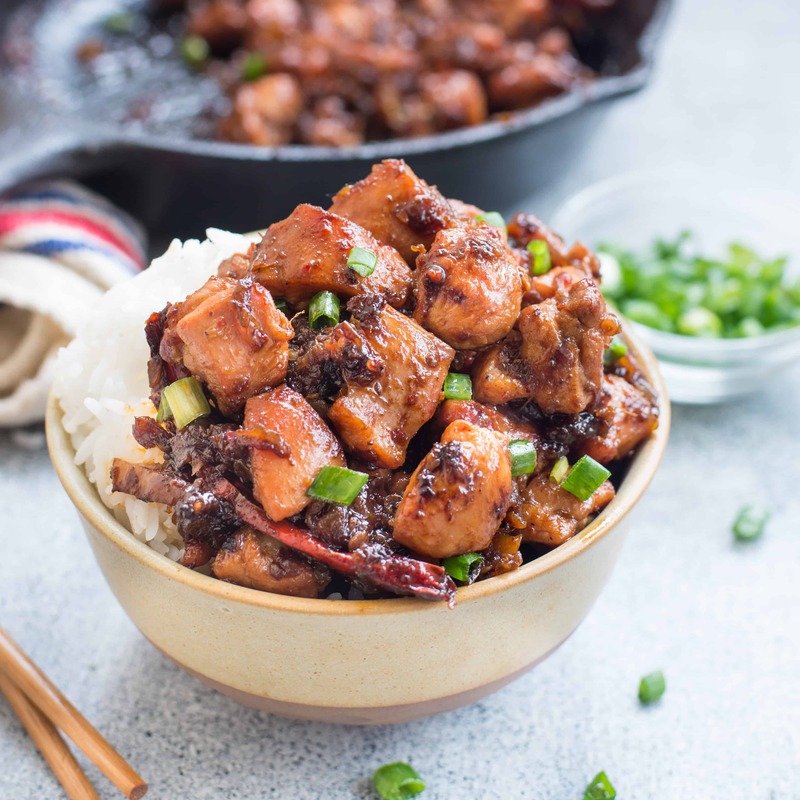 By the way, this is my first Instant Pot Recipe on the blog. Yes!!!! Finally got my hands on the popular electric Pressure Cooker. For more than a year, I have been eying to get one. But honestly, I used to wonder whats so great about Instant Pot. After all, it is just a Pressure cooker and I have been seeing my mom using one since I am a kid. Why is everyone going gaga about this? But after I got one and explored it, It changed my perception. I am quite impressed with the gadget. It is definitely better than the regular Pressure Cooker. If you have never cooked in a regular pressure cooker before I am sure it will scare the hell out of you. But on the contrary Instant Pot is easy to use with good safety features. It is even quicker than a pressure cooker and it has multiple functionalities. 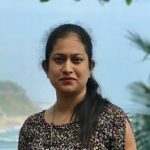 I am definitely going to explore it and try new recipes. 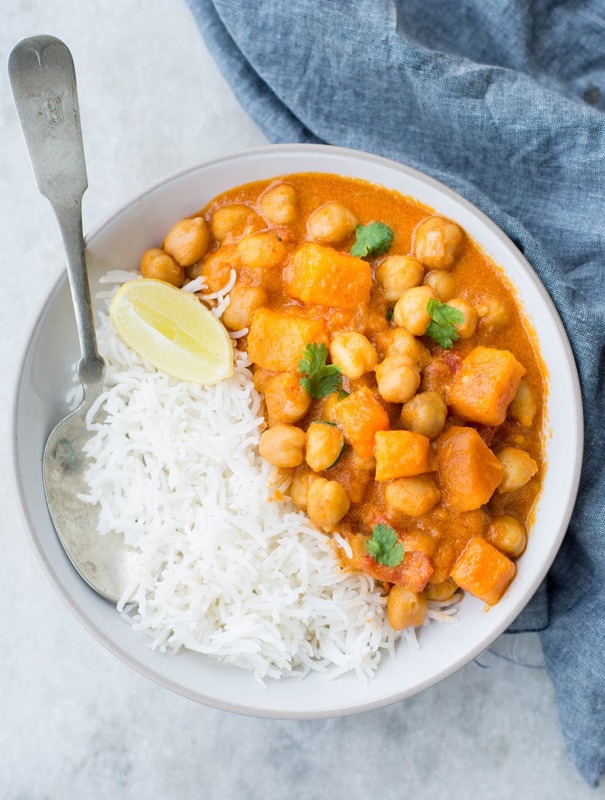 Now back to this Vegan Instant Pot Sweet Potato Chickpea Curry. 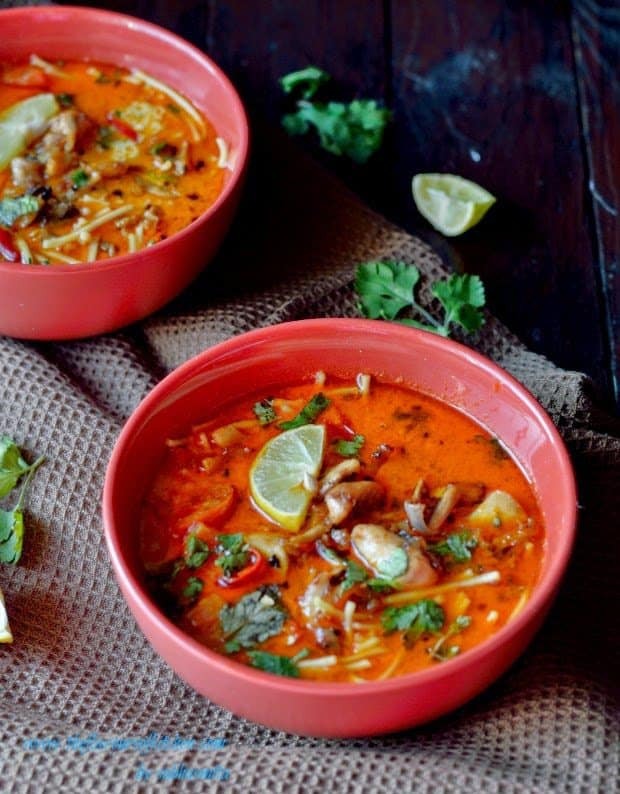 With incredible flavours, this curry is healthy and nutritious. You can easily make a big batch of it and refrigerate. 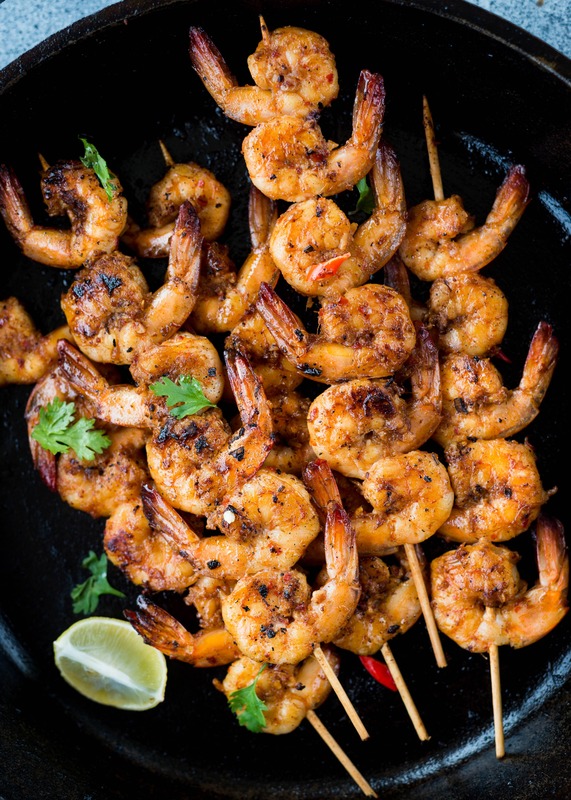 Pair it with rice or Quinoa, fresh cilantro and add a good squeeze of lemon while serving. The ingredients list for this Sweet Potato Curry is also very less. Store brought Red curry paste will work here, so no making from scratch business. To make it more aromatic, there is onion and garlic. It is a great recipe for meal prep, with bare minimum preparation. Make a big batch and divide into glass containers. CAN I USE CANNED CHICKPEAS? I am always used to soak dry beans overnight and next day cook in a pressure cooker till tender. But surely you can use canned beans in this curry. Using canned beans makes the entire process one step easier. If you are using dried chickpea for the recipe, then soak dried beans overnight. Next day cook soaked chickpeas with enough water in a Pressure Cooker or Instant pot for 25-30 minutes. Let the pressure release naturally for 10-15 minutes, then release remaining pressure by placing the vault in the venting position. 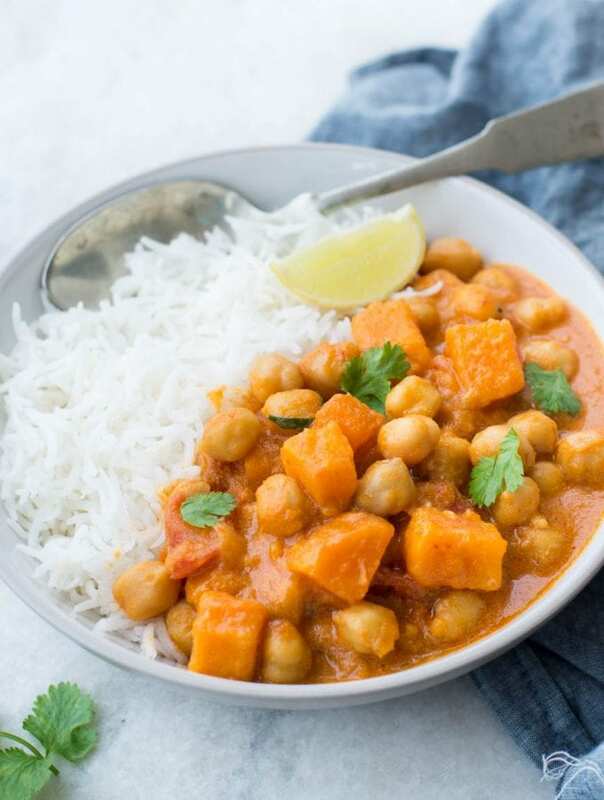 Cooking Chickpea along with other ingredients while making the curry is not advisable, because it may result in overcooked Sweet Potato. Adding Lemon Juice and Fish sauce at the end brings all the flavours together. 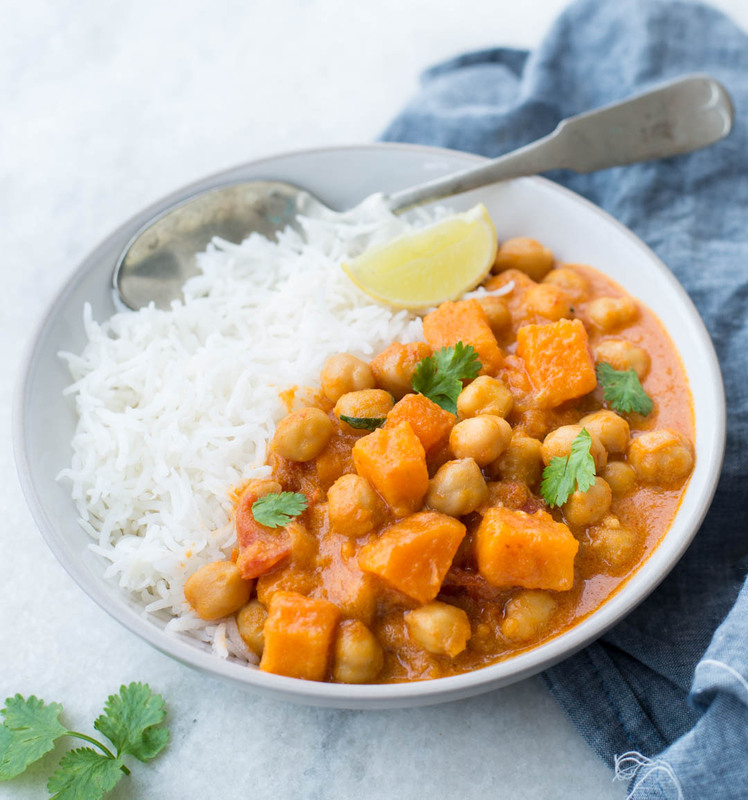 Gluten Free and Vegan Sweet Potato Curry made in an Instant Pot, needs only 30 minutes. 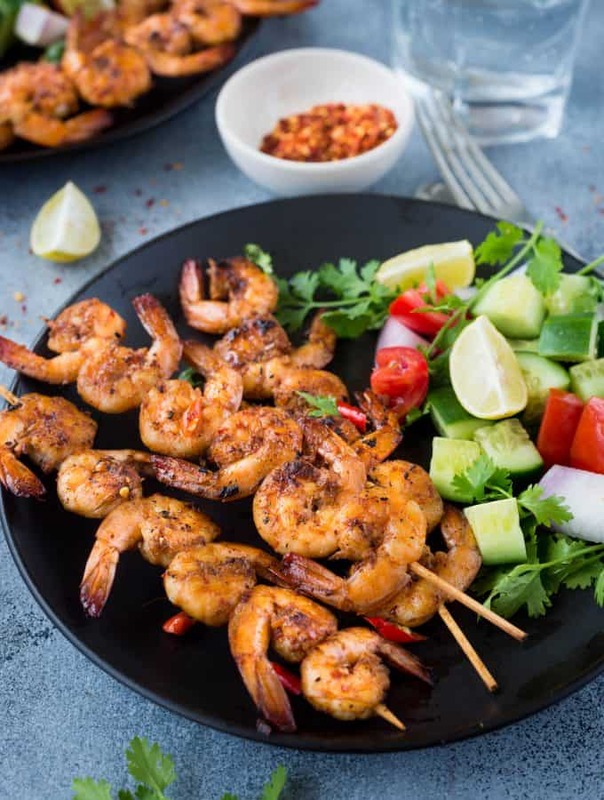 A great mid-week recipe and great for meal prep too. 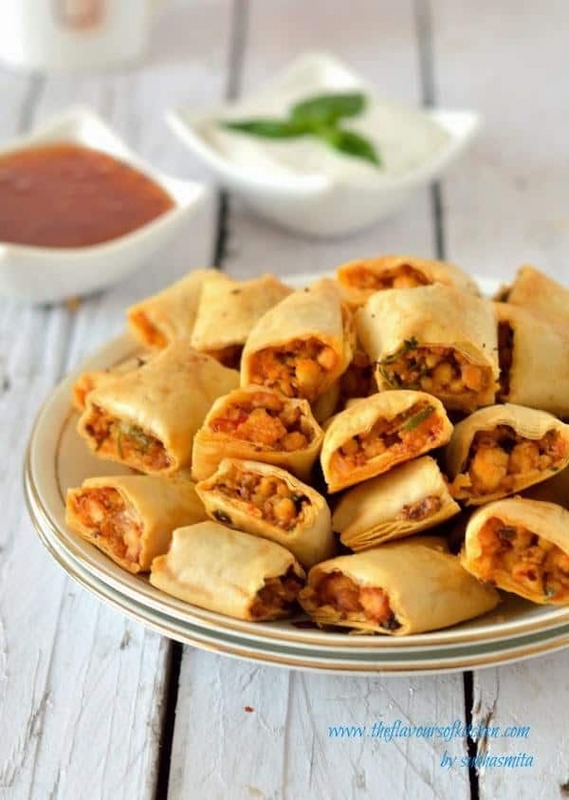 If using dried Chickpea, soak it at least for 6 hours or preferably Overnight. Cook soaked chickpeas in a traditional pressure cooker on high flame for 3-4 whistle, then lower the flame and cook for 10 more minutes. Switch off the flame. Let the pressure release naturally. Alternatively, you can also cook it an Instant Pot. 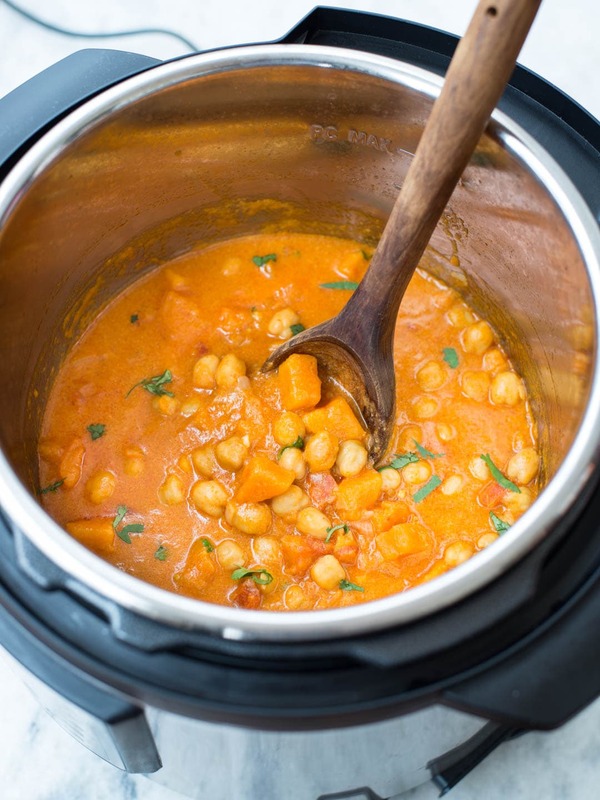 Add soaked chickpeas and water to an instant pot. Cook on high for 25 minutes. Let the pressure release naturally. Turn Saute mode on in the Instant Pot. Once its ready, Add Oil and let it warm. Add chopped onion. Saute/ fry until it has softened and starts to brown. Add minced garlic and cook until the raw smell is gone. Add Red Curry Paste. Mis well and fry for 30 seconds. Add chopped tomato. Cook untill tomato has softened and mixed with onion garlic mixture. Add cooked / Canned Chickpeas, Sweet Potato. Mix everything well. Add in Coconut milk to the Instant Pot. Season with salt. Mix everything well. Turn Manual mode to 'ON' . Set time to 15 mins. Put the valve to 'Sealing' mode. Close the lid and let it cook. When the timer is off, let it rest and let the pressure release naturally for 10 minutes. Then release pressure manually by moving the valve to 'Venting' position with the help of the back of a spoon. Add fresh lemon Juice and Fish Sauce. Stir everything well. Garnish with fresh cilantro leaves, Serve with rice and more lemon wedges. 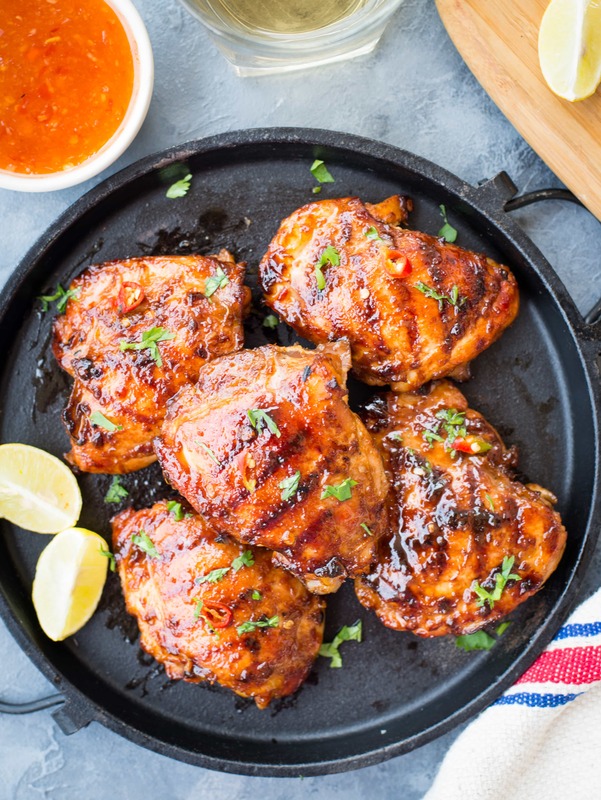 This Sweet and Spicy Thai Grilled Chicken has real Thai flavours. 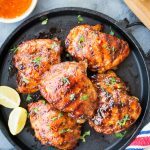 Chicken thighs marinated in Thai Sweet Chili Sauce, Lemongrass, fish sauce and grilled to perfection. With authentic Thai flavour, this Thai Grilled chicken is going to be everyone’s favourite. 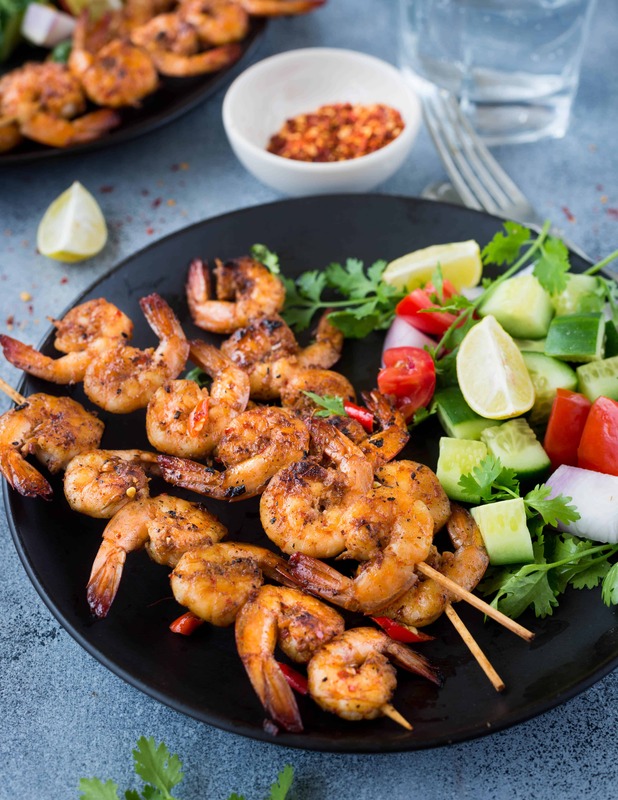 Make a quick marinade of Thai Sweet chilli sauce, soy sauce, lemongrass, ginger, a dash of sriracha, fish sauce, Marinate the chicken and grill on the stovetop or barbecue it. 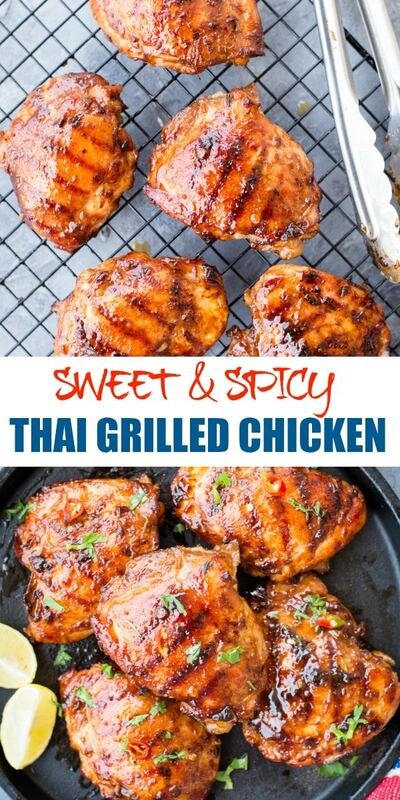 This Thai Grilled Chicken is so good, with juiciest and succulent chicken thighs. You will be making this all summer and it is going to be a heat without any doubt. 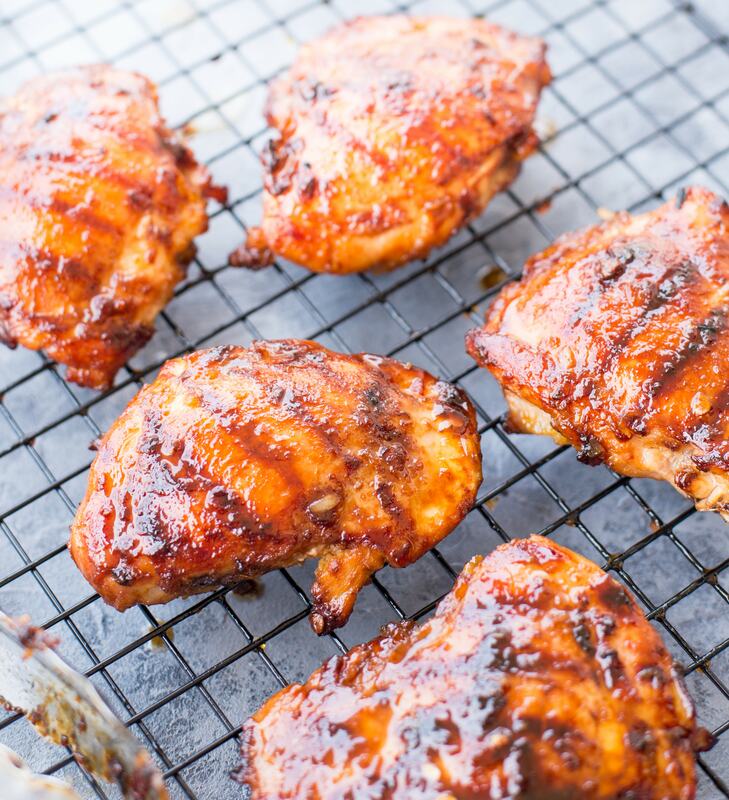 Grilling Chicken can’t be easier than this. Marinate well ahead, then let the grill do all work while you bask under the sun. 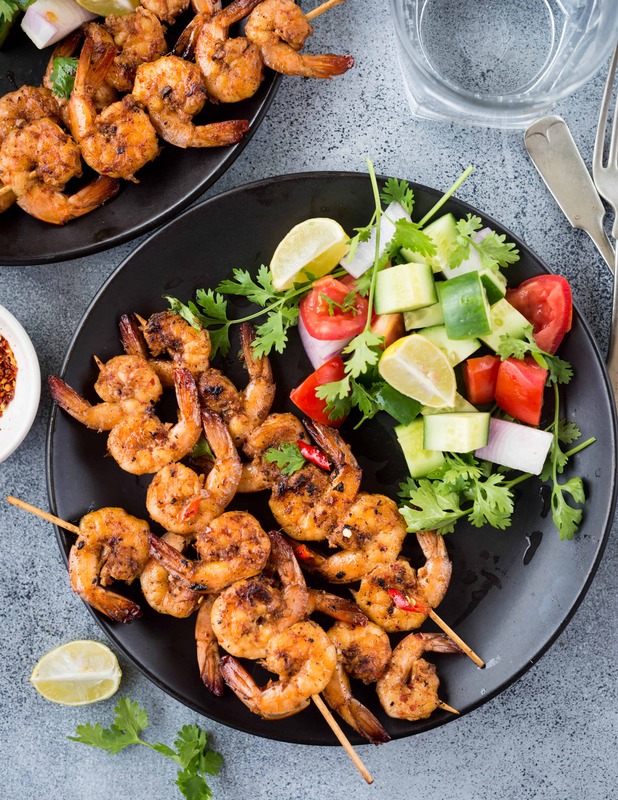 This is the ultimate grilling recipe that everyone should make. I don’t have an outdoor grilling here, so I ended up making it in my grilling pan on stove top. But for the best result and smokey flavour barbecue these under the grill. I love the charred bits when you grill the meat. 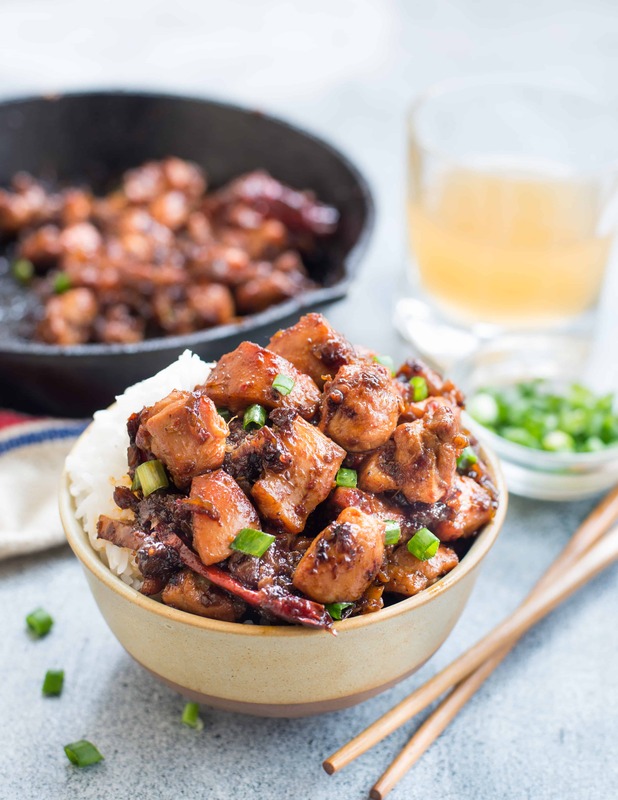 For the best result use boneless chicken thighs. Chicken thighs remain juicy after grilling and doesn’t tend to turn rubbery. You can also use chicken breast but need to careful while grilling. 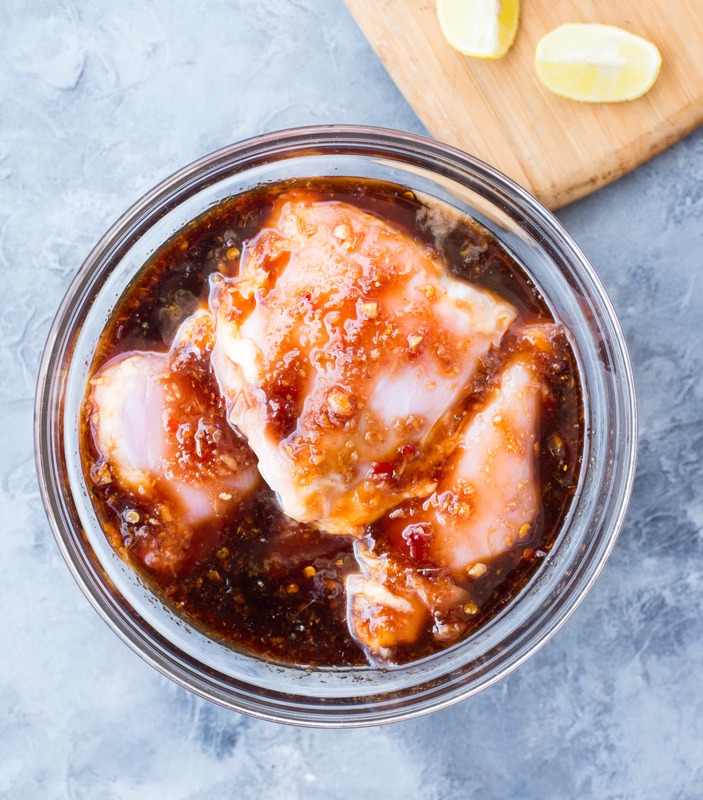 Marinade the chicken at least for 2 hours up to 24 hours. Marinating the chicken for a long time help the meat to absorb all the flavours and it remains juicy and tender while grilling. 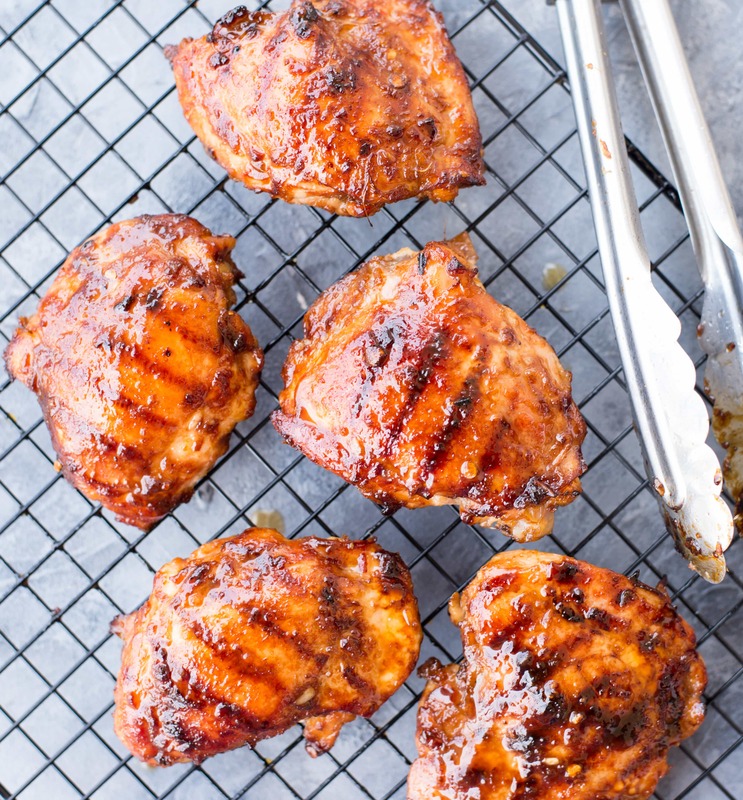 Make sure the marinated chicken is at room temperature while grilling. This ensures even cooking of chicken. While grilling bast with leftover marinade, for succulent and tender chicken. 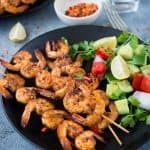 HOW TO MAKE PERFECT THAI GRILLED CHICKEN? Start with making the marinade. In a zip log bag add all the ingredients for marination, mix everything well. Add chicken thighs. Shake well and make sure chicken is well coated with the marination. Let the marinated chicken sit for 2 hours or overnight in the refrigerator. Take the marinated chicken out of the refrigerator and bring it to room temperature before grilling. 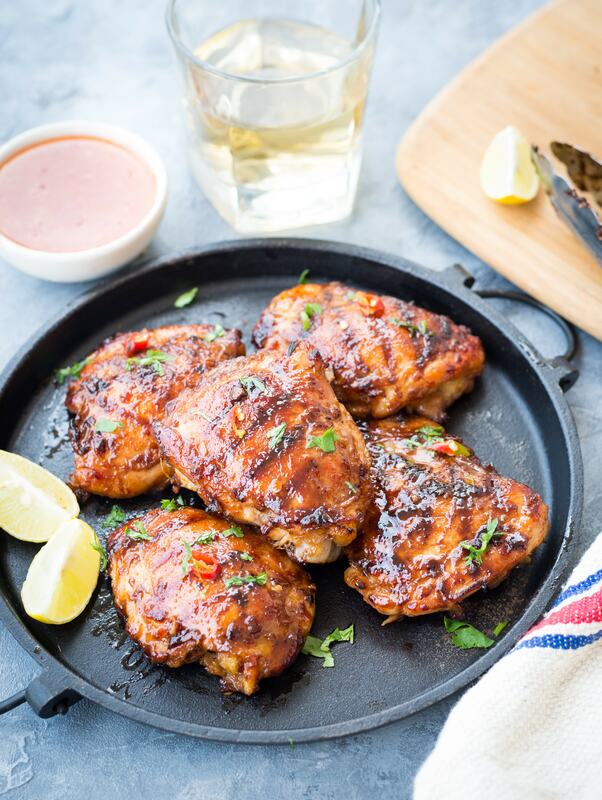 Grill using a pan on the stove top or using a barbecue till the chicken is tender and cooked through. I used a grill pan and sheared chicken thighs for about 3-4 minutes on each side. Then finished it off in the oven. In a zip-lock bag or big mixing bowl mix all the ingredients mentioned above except chicken thighs. Check the seasoning. Add cleaned chicken thighs to the marinade. Let the chicken marinate for at least 2 hours or overnight for best results. Cook chicken about 4-5 minutes on each side, until grill marks appear and chicken is cooked through. If making on the stove-top, heat a grill pan. grease it with oil. Place chicken thigh skin side down. Cook 4-5 minutes. Turn the chicken and cook the other side for another 4-5 minutes. Then broil at the top rack of the oven for 3-4 minutes @ 250 degree Celsius. 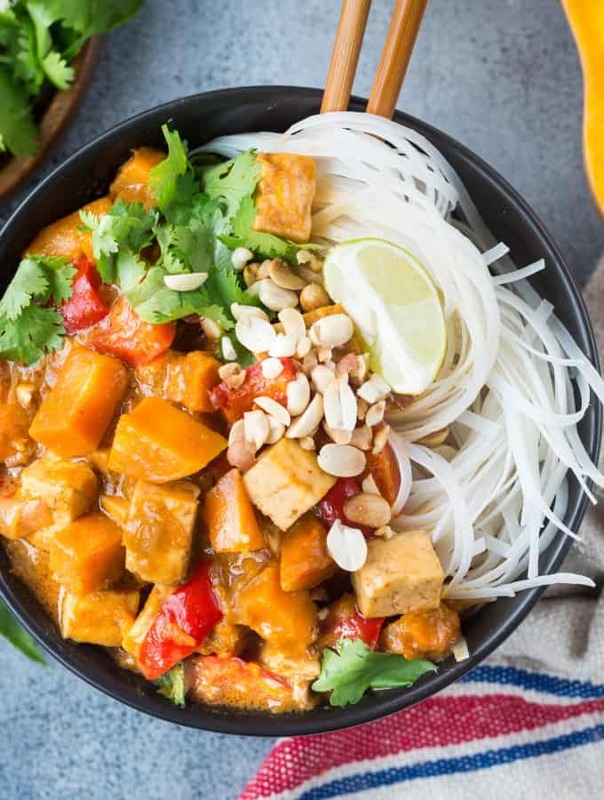 This Butternut Squash Tofu Thai Curry is perfect for winter. 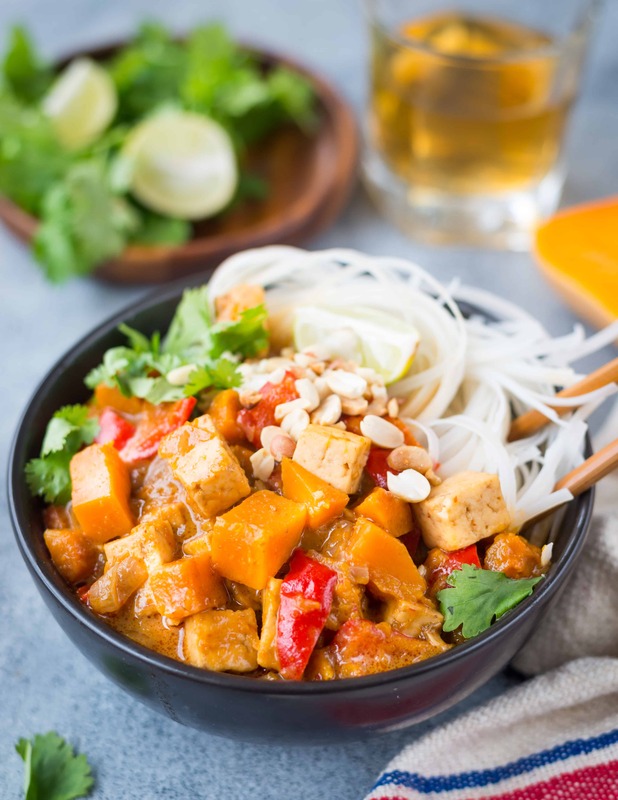 It is Vegan, Gluten Free, creamy and with amazing Thai flavors. 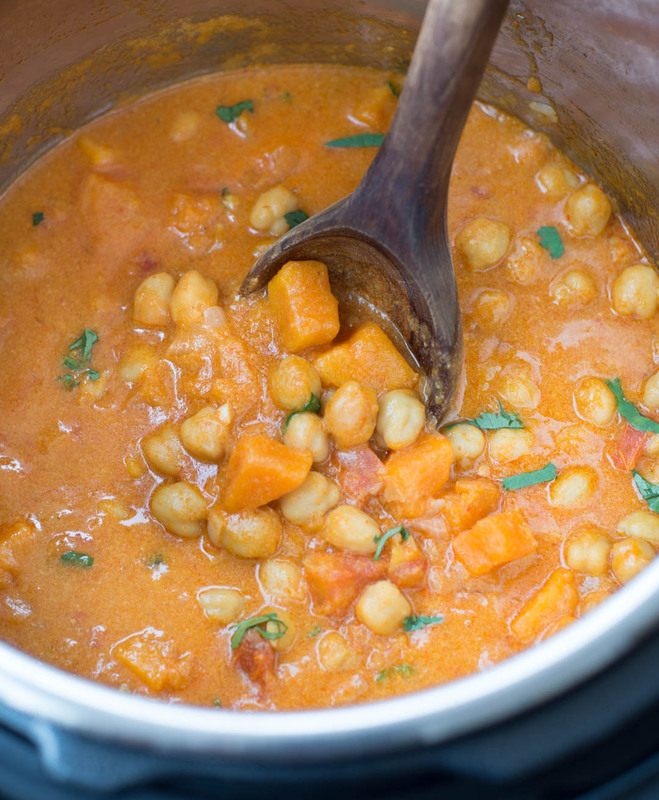 Make use of all those fall favorite Butternut Squash in this delicious curry. Finally, We are in the best part of the year. Winter is my favorite for all the good reasons. Winter means Warm Woolen wear, Cozy long nights and of course Comfort food. Today was such a day when I was craving for some warm soup or a curry. As all the ingredients were pretty much available in my refrigerator, ended up making this lip-smacking Curry. I used readymade Red Curry paste in this recipe. I usually make my own red curry paste, when I have all the ingredients available. But I also keep readymade paste always handy. We love Thai curry and it is easy to make if you have some curry paste available. Recently I have grown a bunch a lemongrass in my little kitchen garden. It is so easy to grow and low maintenance too. Cut the stems of lemongrass stalks, put the roots in a glass of water half submerged. In few days you will see roots growing, then remove from water and put them in the soil. Whenever I use readymade curry paste, I add some minced fresh lemongrass to it. It makes the curry flavourful and more refreshing. Though I make a non-veg version of this either using chicken/prawn, this vegetarian version is equally good. Squash gives a mild sweetness and gives the gravy a smoothness. 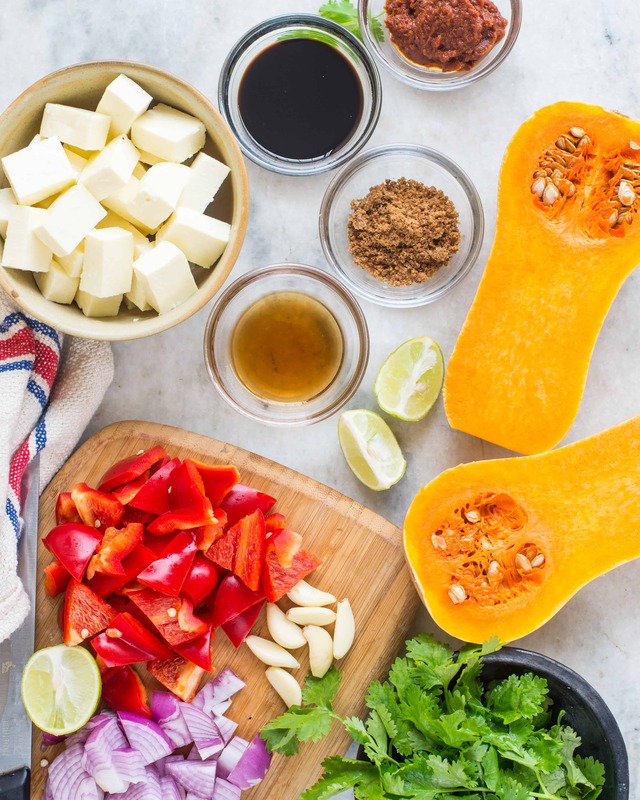 One thing you need to keep in mind is, don’t overcook the squash. Keep them little chunky. To make the gravy little creamy, press few chunks squash using a slotted spoon. 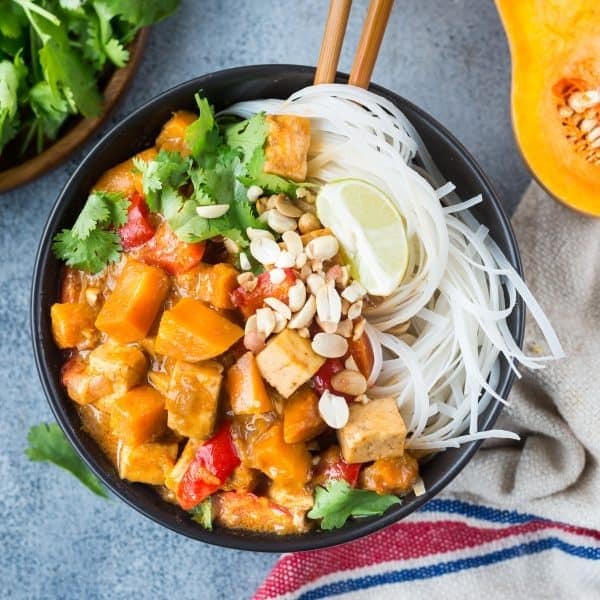 This Butternut Squash Tofu Thai Curry is perfect for winter. It is Vegan, Gluten Freee, creamy and with amazing Thai flavors. Make use of all those fall favorite Butternut Squash in this delicious curry. Heat oil in a pan. Once oil is hot, add sliced onion. Saute onions till it is soften. Add minced garlic. Cook for 30 seconds. Add cubed butternut squash. Cook for 1-2 minutes. Add red curry paste, soy sauce,fish sauce and brownsugar. Mix well. Saute for a minute. Add thin coconut milk and stock. Cover and bring everything to a boil. Cook on medium heat for 5 minutes. Squash cubes would start to soften. Add red bell pepper and tofu. Add thick Coconut milk. Cook 1-2 minutes on medium heat. While the curry is being cooked, with the back of a spoon or spatula slightly press few pieces of squash. (This is optional, but it makes the curry thick and creamy). Squeez some lemon juice if desired. Garnish with fresh coriander leaf and chopped peanuts while serving. Switch off the flame. Serve on a bed of plain steamed rice or noodles. 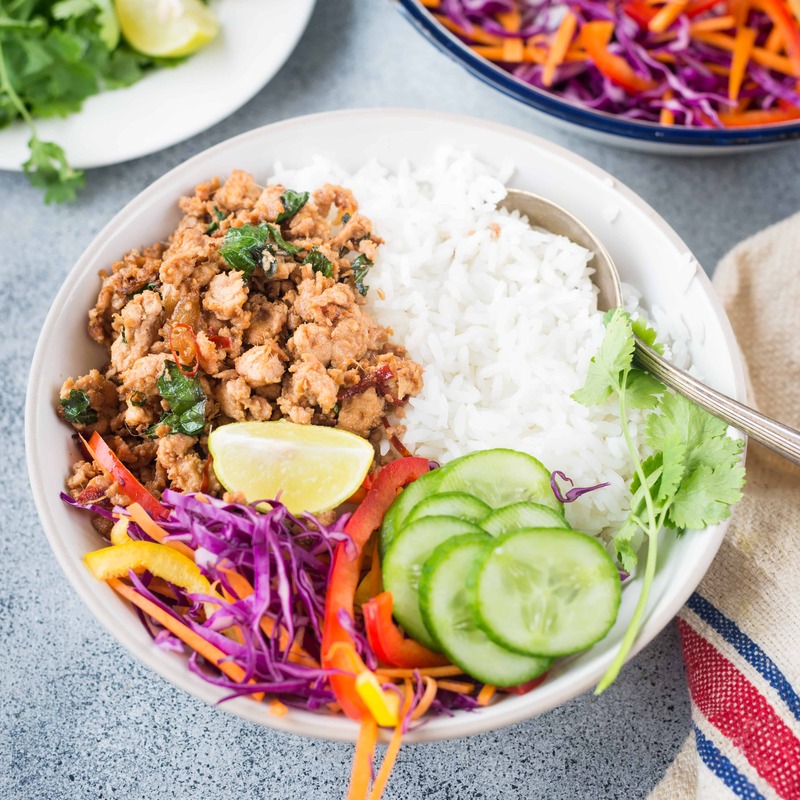 A hearty rice bowl with Thai Minced Chicken, Crunchy fresh salad and off course rice. 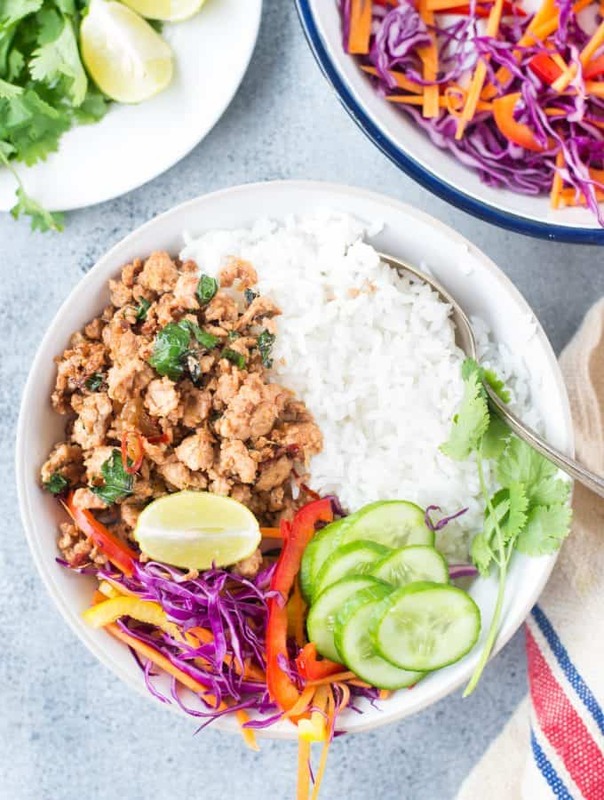 Takes 15 minutes to cook the Thai Basil Minced chicken and another five minutes to put together the rice bowl. Your dinner would be ready in just under 30 minutes. We love everything about this rice bowl. To be honest I really like the entire concept of one bowl meal. You keep digging the bowl and keep discovering different layers of taste and texture. So most of the time I make a lunch bowl out of my everyday lunch menu.. My lunch bowl always consists of some grain, good portion of protein( mostly chicken) or some vegetable curry and a fresh salad. Sometime I also add some fried chips or papad/Papadum to the bowl. Do give this lunch bowl thing a try and I am sure you are gonna love it. 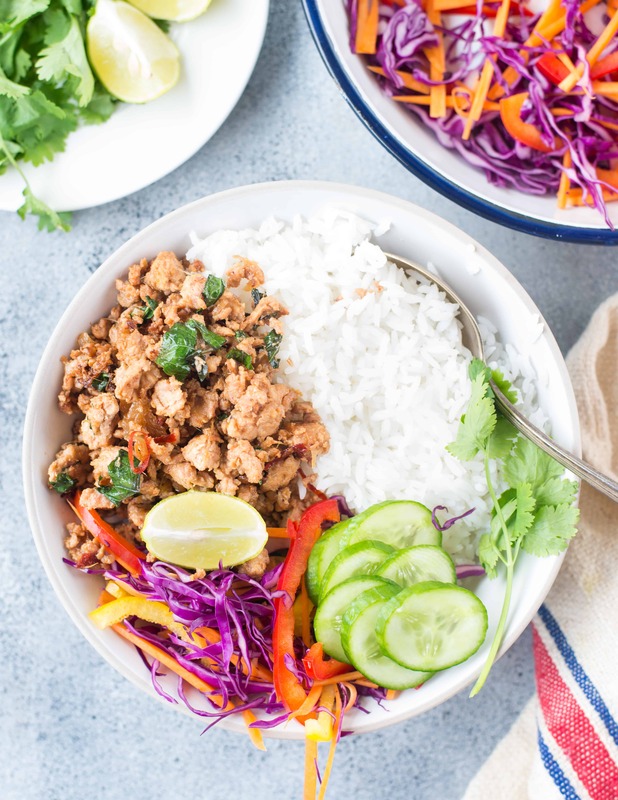 Before I start talking about this Thai Basil Chicken Bowl and its robust flavor, first let me tell about the star ingredient of the dish THAI BASIL . The two most common type of basil used in cooking is Thai Basil and Italian Basil. And one should not get confused with these two herbs. Both are very different to look and taste. Thai Basil grows on purple stem. The leaves are firm with purple veins. It has a very strong pungent taste. While Italian basil has more of a subtle sweet flavor. I love using Italian basil in pesto. Both these herbs are not interchangeable in a recipe at least I have never done so. Many sources says that Thai basil can be substituted with Mint leave ( I am yet to try). 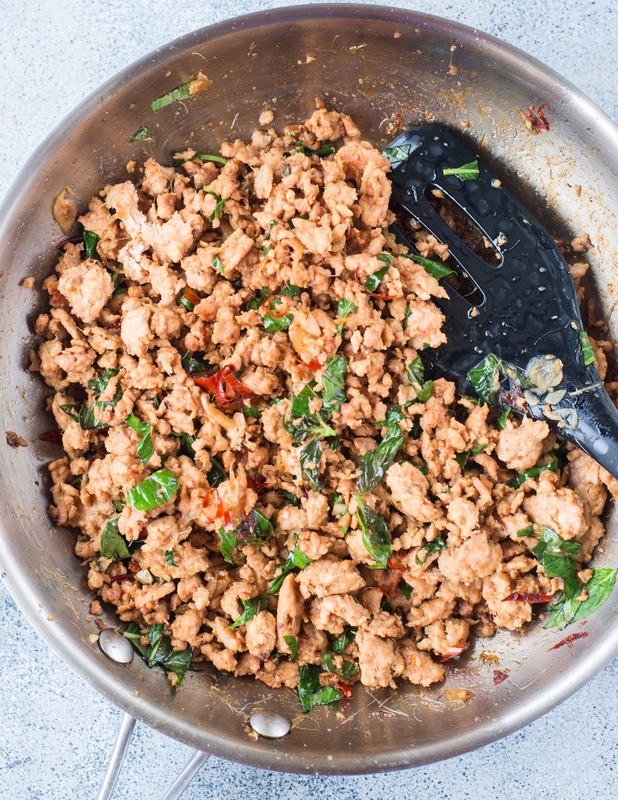 So if you would like to try this recipe make sure you use Thai Basil. Heat a pan. Add Oil. Once the oil is medium hot add minced garlic followed by sliced shallots. Fry till the shallots have soften and starts to brown. Add minced chills and lemongrass. Cook for 30 seconds more. Then add minced chicken. Mix everything well and cook for 4-5 minutes. Add brown sugar and salt as per taste. Stir well and cook till all the water has evaporated and the mixture starts to brown a little bit. Add Soy Sauce and Fish sauce. Mix well. Cook for a minute on medium - high heat. Add fresh chopped basil. Mix and take the pan out of the stove. For the Salad mix Cabbage, carrot and peppers. Season with salt. To make the rice bowl Spoon cooked white rice bowl. Top it with Thai Basil minced Chicken, salad, Cucumber slice, Lemon wedges and garnish with fresh Coriander leaves. 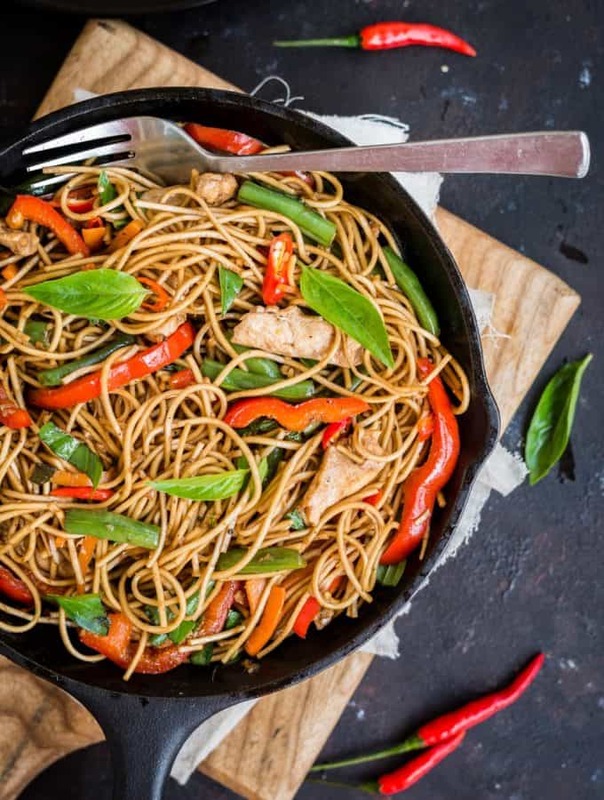 A fairly simple stir fried chicken noodles with bursting Oriental flavours. This Oriental chicken noodle is quick to make,loaded with veggies and protein. I had this Oriental noodles a couple of years back in an Oriental restaurant and was totally hooked to the flavours. 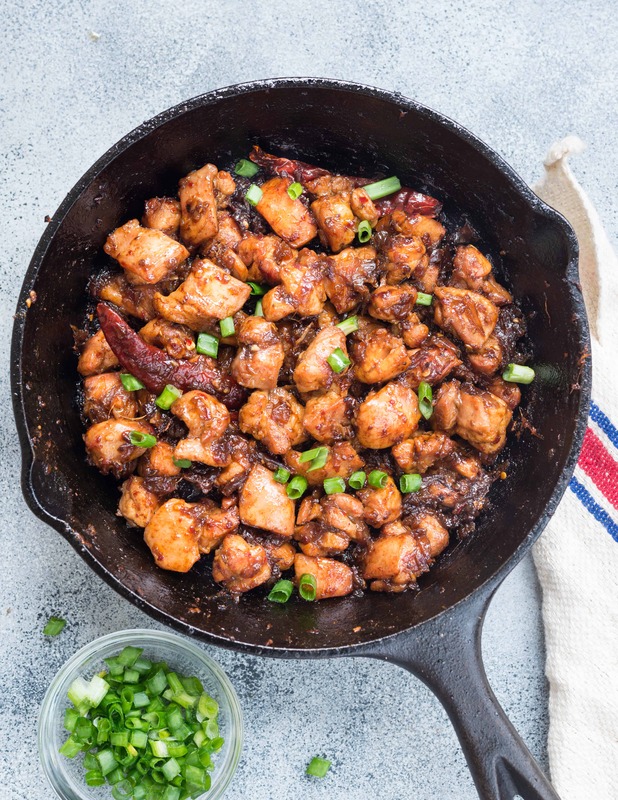 The best things about this one pan dish are the sauce and lots of fresh Thai basil….